The first step to enrolling in this special program is to submit this enrollment form online. Thank you so much for your interest in our Toddler Art Program. Come join the FUN at this art open studio! 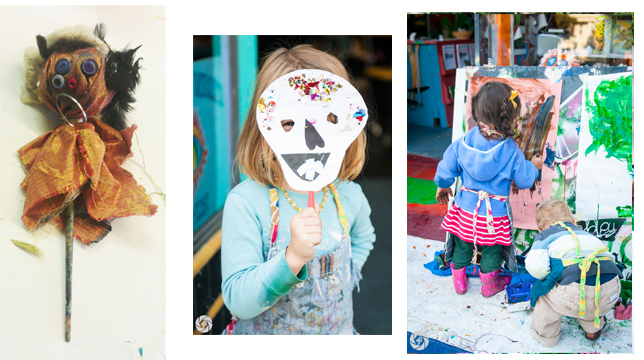 Introduce your child to a world of art making. Students explore painting large, drawing, play dough, 2D and 3D craft-making. A wonderful opportunity for parent/caregivers and child to be creative together. Come join the FUN at our art open studio! Introduce your child to a world of art and imagination. In this hands-on environment students explore 4 stations each class; painting, play-dough and two craft-making. A wonderful opportunity for parent/caregivers and child to be creative together. Program always contain tempra painting and play dough. Place: Meet at Precita Eyes Mural Arts Studio at 348 Precita Ave. San Francisco, CA 94110. The program fee pays for all the costs associated with offering this program and supports the Precita Eyes Muralists mission. $8 discount rate only applies when class has 8 or more students. It is available for those who need financial aid, for those enrolling more than one family member, and for Precita Eyes members (to learn more about becoming a member, click here). Please note in the appropriate section of the enrollment form below if you will require this discounted rate. For FINANCIAL AID please fill out the form HERE. There is a max capacity of 12 students per class and there must be at least 8 students confirmed a week before in order for it to move forward. Thus, you will receive an email from Precita Eyes a week before or sooner confirming your spot. If there are not enough students enrolled a week before, the class may have to be cancelled and relaunched at a later date. You do not have to pay the program fee until you receive your confirmation email with further instructions on how to pay. Sorry, NO REFUNDS, MAKE-UP CLASS OR DISCOUNTS for missed classes or no-shows. Share this link on social networks, parent groups, etc. If enrolling more than one child from the same family, please choose "Additional Student" below and add their name. If you don't know who this will be or if it may vary, explain that here. One Session $72 (1 child) One Session $56 (*Financial Aid / Member Discount-I am a currently a Precita Eyes member) One Session: $132 (*Sibling Rate - 2 children) One Session: $120 (Member fee & discounted workshop fee) Two Sessions: $144 (1 child) Two Sessions: $112 (*Financial Aid) Two Session: $264 (*Sibling Rate - 2 children) Three Sessions: $216 (1 child) Three Sessions: $168 (*1 child Financial Aid) Three Sessions: $396 (*Sibling Rate - 2 children) Sample drop-in $20. *One time only. *Discount / sibling rate only applies when class has 8 or more students. B. By check: Please make check payable to 'Precita Eyes Muralists Association, Inc.’ not ‘Precita Eyes’ and deliver or mail to Precita Eyes Mural Arts & Visitor Center, 2981 24th Street, San Francisco, CA 94110. Sample drop-in. If you are interested in dropping in to sample our class, let us know what date you plan to arrive. For Paypal payments please pay under Toddler/Preschool Arts Class description here. I have read and accepted the terms and conditions. I have read and accepted the terms and conditions, but I do not accept the Media Release. How did you hear about the Toddler Art program? How did you hear about Precita Eyes?